Emmanuel has several Home Groups which meet either weekly or bi-weekly in members’ home with the aim of sharing fellowship and looking into God’s word. In fact, each group aims to be: under the word of God, alongside one another, looking upwards in prayer, reaching out in mission and building up the church family through serving. The Home Group leadership team is our minister Bart Erlebach, Joanne & Robin Walpole and Amanda Kresinska. 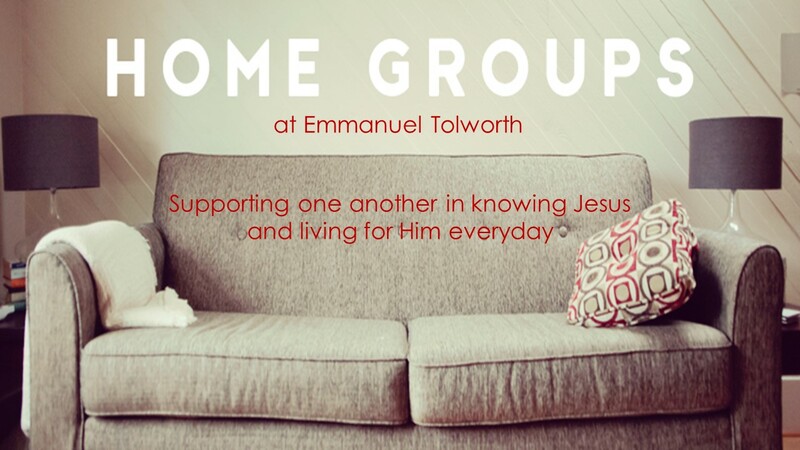 If you would like to know more about joining a Home Group at Emmanuel, please contact the Church Office. Our aim is to provide an opportunity for over-60s in our local community to get together and enjoy one another’s company. We normally meet on the 1st and 3rd Wednesday of the month at 2.30pm in Emmanuel Church Hall. Tea, coffee and cakes are served at every meeting. There is always plenty of opportunity to socialise. Activities may include puzzles, Scrabble and board games. Occasionally there are outings or a short talk on a subject of interest. Every meeting includes a 5 minute Bible based talk relevant to our lives. For more details please contact the Church office. For meeting dates for this month, please go here.